ANN BAILEY died on February 13, 2017 at Victoria General Hospital, with her family by her side. Ann will be lovingly remembered by her husband, Gary Craven; her children, Trevor and Sara; her brothers, Ron (Sharon Goertzen) and Robert (Brigitte Insull); her sister, Mary Stanger (Ted); brother-in-law, Ian Craven (Barb); and sister-in-law, Sandra Craven (Clint Miller). Nephews and nieces treasure fond memories of Ann, including: Melissa, Graham and Emma Bailey; Margaret Stanger (Jerrimy Seavers); Melanie Gluchi (Kyle) and Curtis Craven (Patti). She is survived by her step-mother, Barb Bailey and her mother-in-law, Noreen Craven, as well as numerous extended family and friends. Ann was predeceased by her parents Raymond and Joan Bailey and her nephew Dustin Craven. Ann was born in Morris, Manitoba and grew up there until the age of five, when she moved to Winnipeg. She started her academic career at the University of Winnipeg and obtained her Bachelor of Arts Degree. She later moved to Ottawa for work but returned to Winnipeg to pursue her Bachelor of Law at the University of Manitoba in 1977. After her call to the bar, she practiced family law with the firm of Krawchuk Galanchuk before joining the Legislative Counsel Office of Manitoba Justice as a Crown Counsel in 1986. Ann was a dedicated public servant. Never one to be afraid of hard work, she had a deep respect for government and the process by which the law is made. With her commitment and hard work, she lived what she taught, “seat of the pants on the seat of the chair until the job is done and done well”. Her office benefitted from much more than her talent for drafting laws and dealing with clients, she took a personal interest in each co-worker and brightened spirits with her sense of humour. Public service was a natural fit for Ann since she always tried to make her community a better place. Volunteering with charitable organizations, supporting the arts, participating in sport and fitness activities and enjoying nature from Fort Whyte to baby falcons, she was always ready to contribute. Her actions reminded us all to patronize local artists and small businesses, protect the environment, drop off clothes to women’s shelters and generally be compassionate and responsible members of society. Throughout her life Ann loved to travel. She shared this love of travel with her friends and family through many wonderful trips. When they were first together, she accompanied Gary on his consulting work in the Caribbean and in Australia. They enjoyed sailing with friends in the Caribbean and many family trips throughout the U.S. and Mexico. While her daughter, Sara, studied in France, she met her there and they toured Italy. In recent years, Ann and Gary shared many wonderful vacations including travels to Europe and Asia. Ann was a loving wife, mother and friend. She was truly both the foundation and roof of her family, looking out for everyone and holding everyone together. Grounded and wise, her genuine caring and generosity touched all those around her. The family would like to thank the doctors, nurses and aids who professionally and skillfully attended to Ann during her stay at the Wilcox Memorial Hospital in Lihue, Hawaii as well as the nurses in the Community Palliative Care Program and at CancerCare Manitoba. Donations in memory of Ann Bailey may be made to the Manitoba Schizophrenia Society, 100 – 4 Fort Street, Winnipeg, Manitoba R3C 1C4; Agape Table, 175 Colony St. Winnipeg, Manitoba R3C 2W2 or a charity of one’s choice. Her funeral service will be held at St. John’s Anglican Cathedral, on Wednesday, February 22nd, at 2 p.m. 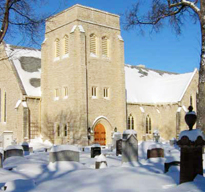 The Cathedral is located at 135 Anderson Avenue in Winnipeg, between Main St. and the Red River, just north of St. John’s Park (Main and Mountain). There is street parking on every side of the Cathedral (and at least one gate) and time limits have been lifted for the afternoon.